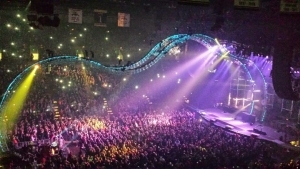 As a music nut who grew up on classic rock, rap, hair bands, Metallica, and so many rock and blues greats, the bar for attending a great arena show is higher than what is fair to bands today. After all, I’ve experienced the Tommy Lee drum kit roller coaster in person, Alice Cooper twice, as well George Harrison’s tribute concert featuring Tom Petty, Paul McCartney, Eric Clapton and Jeff Lynne. All that aside, I knew TWENTY ØNE PILØTS would be bringing their fastball. I had been looking forward to this show for awhile. Any band where the musicians can play multiple instruments and have the creativity and energy they do in their videos will never disappoint live. The scene walking inside the North Charleston Coliseum was not at all what I expected. Sixty percent of the crowd was screaming middle and early high schoolers. Thirty percent of the crowd was my bracket – the late 30s and up.The difference being they were parents there with their kids while I was there with two friends in their early 20s. And only 10% college crowd. My how life goes by. There was never a single person in any beer line all night if that helps paint a picture. That doesn’t mean anything in the grand scheme as all eyes are on the band, which was clear by the high pitched screams every time drummer, Josh Dun, took his shirt off. The show started out like all great ones. A large, black curtain blocked the stage as anticipation grew with each minute that went by. At 8:59pm, the only visible lights where the hand-held flashlights through the curtain from the roadies doing their final checks. The pre-audio clip started blaring and then the curtain dropped and out came the dynamic duo to the very intense track, Heavydirtysoul. Two young fellas directly in front of me I’d ballpark around 6th grade were absolutely losing their minds. They could not stop turning to each other and shaking each violently screaming “OH MY GOD!” I have to say it was extremely cool seeing how happy they were. We’ve all been there before seeing our favorite band for the first time. This continued for three songs. How Josh Dun and Tyler Joseph have been able to connect with their fans with their lyrics on bullying and not fitting in is made crystal clear with their live shows. At one part of the show a video came on of the two many years ago on the road trying to fix a flat on their van. And playing house parties for eight people. It was very humbling and sent a clear message they are still close to their original pre-fame selves and wanting to stay on the same level as their very loyal fans. There wasn’t a single inch of this arena this band didn’t connect with physically. 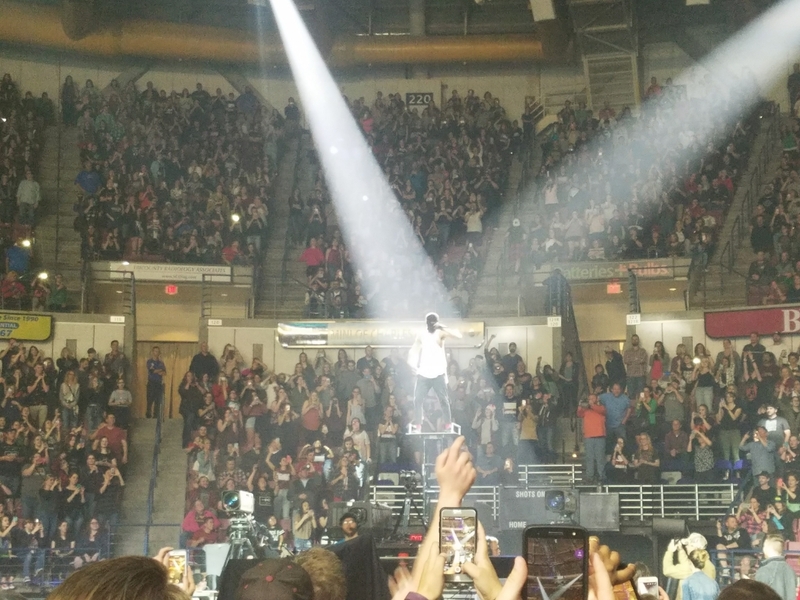 For one song, lead singer, Tyler Joseph, was up in the upper deck after a nice body double trick that fooled all 10,000 fans. For a set of other songs, they had a drum kit and piano setup on another stage on the other side of the floor that sent fans running back and forth. Then, in between songs, Tyler Joseph jumped into a human hamster ball and rolled through the crowd. The show felt like one big living room, which is always a winner when you add in the lasers, smoke towers, and incredible music. Their high energy, 24 song set list spanned two hours and they perfectly peppered their hits with a string of vintage, hit covers, which they sang back to back in the following order: Tubthumping (Chumbawamba), No Diggity (Blackstreet), Where Is the Love? (The Black Eyed Peas), and Jump Around (House of Pain). One thing I did find quite interesting is that lead singer, Tyler Joseph, wasn’t actually playing his instruments for most of his songs, which included bass guitar, piano, and ukulele. The band plays against a track for obvious reasons given all the synthesizers in their songs. Drummer, Josh Dun, clearly was pounding the drums all night, but being as close as I was to the piano, you could tell the playing wasn’t even close to the track. Regardless, it was still a great show and I look forward to the next album. Link to the full set list.